This view of Europa is based on information from NASA's Galileo mission of the 1990s. This new, remastered version, released in 2014, features more realistic colors, showing how the Jupiter moon would look like to the human eye. MOFFETT FIELD, Calif. — A potential NASA mission to Jupiter's moon Europa may end up hunting for signs of life on the icy, ocean-harboring world. NASA officials have asked scientists to consider ways that a Europa mission could search for evidence of alien life in the plumes of water vapor that apparently blast into space from Europa's south polar region. 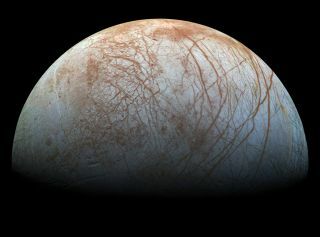 "This is our chance" to investigate whether or not life exists on Europa, NASA science chief John Grunsfeld said here Wednesday (Feb. 18) during a Europa plume workshop at the agency's Ames Research Center in Silicon Valley. "I just hope we don't miss this opportunity for lack of ideas." Artist's concept of the Europa Clipper mission concept, which would send a probe to do multiple flybys of the ocean-harboring Jupiter moon. And now, it appears, NASA would like to add plume sampling to the Europa mission's task list, if possible. Grunsfeld urged workshop attendees to "think outside the box" and come up with feasible ways to study the moon's plumes. Grunsfeld stressed that he and other NASA higher-ups aren't pushing to turn Clipper into a plume-centric project; the core goals of the Europa mission will remain centered on assessing the moon's ability to support life, whatever comes out of the Ames workshop. But he doesn't want the plume opportunity to slip away for want of effort or focus. "I don't want to be sitting in my rocking chair 20 years from now and think, 'We should have done something,'" Grunsfeld, a former NASA astronaut who helped repair and service Hubble on three separate space shuttle missions, told Space.com at the workshop. A probe such as Clipper could zoom through the plume, which may rise as high as 125 miles (200 km) above Europa's surface; the probe could snag material using an aerogel collector, some workshop presenters said. The basic idea was demonstrated by NASA's Stardust mission, which returned particles of the Comet Wild 2 to Earth in January 2006. Researchers would of course love to analyze bits of Europa material in well-equipped labs here on Earth, but bringing samples back is likely beyond the scope of the flyby mission currently under consideration. And it may be possible to detect biomolecules onsite, using gear aboard a Clipper-like probe, researchers say. "If you get 20 amino acids, all with the same chirality, that would be, I think, compelling," McKay said, adding that spacecraft such as NASA's Mars rover Curiosity and Europe's Rosetta comet probe have the ability to determine chirality in sample molecules. But collecting enough plume material to perform such analyses will likely prove extremely challenging. Indeed, it may require flying so low and so slowly that it makes more sense to send a lander down to the Europa surface through the plume, said astrobiologist Kevin Hand of NASA's Jet Propulsion Laboratory in Pasadena, California. And all of this discussion assumes that the spacecraft will be able to find the water vapor when it gets to Europa. At the moment, the plume remains unconfirmed; scientists have pointed Hubble at Europa repeatedly since the initial December 2012 detection, but have come up empty in attempts to spot it again. The plume discovery team plans a number of additional Hubble observations through May of this year. NASA officials, and much of the planetary science community, are eagerly awaiting the results.